Does the Crime of Attempted Driving Under the Influence (DUI) Exist in the State of Florida? In this recently filed brief, I argue that the crime of attempted driving under the influence exists under certain narrowly delineated conditions. The Defendant in this case had been discovered asleep behind the wheel of a parked running automobile located in a private lot. The judge refused to instruct the jury on the crime of attempted DUI and the defendant was convicted. In this case, Appellant specifically requested that the jury be instructed as to the lesser-included crime of attempt. Ultimately the trial court denied this request, and refused to allow the jury the option of convicting Appellant of attempted driving under the influence. (b) any offense that as a matter of law is a necessarily included offense or a lesser included offense of the offense charged in the indictment or information and is supported by the evidence. The judge shall not instruct on any lesser included offense as to which there is no evidence. Therefore, the trial court erred in refusing to instruct the jury as to attempt, if Appellant demonstrates: 1) that attempted DUI is an offense; 2) that there was evidence to support the instruction; 3) the evidence did not only prove a completed offense, and 4) attempted DUI is a lesser included offense of the crime charged in the Information. Notably, the Court declined “to accept the State's invitation to decide the broader question of whether the crime of attempted DUI exists at all in Florida.” Id. Florida Statute 777.04(1) defines the crime of attempt: “A person who attempts to commit an offense prohibited by law and in such attempt does any act toward the commission of such offense, but fails in the perpetration or is intercepted or prevented in the execution thereof, commits the offense of criminal attempt.” Nothing in this definition rules out a crime of attempted driving under the influence. In Sykes v. State, 434 So.2d 325 (Fla. 1983), the Florida Supreme Court held: “By including the words, "or endeavors to obtain or use," the statutory language reveals on its face a legislative intent to define theft as including the attempt to commit theft.” Sykes, 434 So.2d at 327. The Court explained: “When one of the ways to commit the offense is to attempt, endeavor, or offer to commit the offense as otherwise defined, then the offense is fully proved by proving such attempt, and there is no separate crime of attempt.” Id. Therefore: “The jury should not have been instructed that attempt was a lesser included offense, nor should they have been given the option of finding respondent guilty of this nonexistent crime as a lesser included offense.” Id. Appellant notes that “actual physical control,” while an alternative method of proving “driving under the influence,” is different than attempt. The Florida Legislature has not defined “actual physical control.” The Florida Standard Jury Instructions for Criminal Cases offers this definition: “Actual physical control of a vehicle means the defendant must be physically in or on the vehicle and have the capability to operate the vehicle, regardless of whether [he] [she] is actually operating the vehicle at the time.” Fla. Std. Jury Instr. (Crim.) 28.2 Thus mere presence in a vehicle is not necessarily sufficient to establish the offense. Rather, it is a question for the jury to determine whether the evidence demonstrates that a person had “the capability to operate the vehicle.” It is reasonable and logical that a jury could find a defendant guilty of attempted driving under the influence, even when instructed on “actual physical control.” The evidence could show that a defendant had taken an act towards the commission of the crime, yet failed, because they did not have “the capability to operate the vehicle.” An example would be where a defendant was asleep behind the wheel. As the trial judge below repeatedly noted, there was some evidence to support Appellant’s request for a jury instruction as to the crime of attempted driving under the influence. (V. 4 pp. 491, 494, 497) Unlike the defendant in Mollenberg, supra, there was no direct evidence that Appellant drove his vehicle while impaired. He was discovered inside the driver’s seat of a running vehicle, which was parked in the lot of an open private business. The jury should have been allowed to decide whether he was in actual physical control, or whether he had attempted to commit the crime. In Mollenberg, the court rejected the argument that the rule of lenity required giving an attempt instruction where there was undisputed evidence of driving. In this case, however, the rule of lenity applies. Florida Statute 775.021(1) establishes the rule of statutory construction: “The provisions of this code and offenses defined by other statutes shall be strictly construed; when the language is susceptible of differing constructions, it shall be construed most favorably to the accused.” Actual physical control is an alternative method to proving an element of the crime of driving under the influence, yet does not include “attempt” in its definition. Construing the statute most favorably to the accused means that attempt should be offered to the jury as a lesser included offense. Under the facts of this case, the jury should have been allowed the option of exercising its pardon power. This is "the jury's inherent power to pardon a defendant by convicting the defendant of a lesser offense." State v. Estevez, 753 So.2d 1, 4 (Fla. 1999) (internal quotation marks omitted) “This "pardon power" allows the jury to acquit a defendant of a greater offense and convict him or her of a lesser one even though the evidence supports both crimes.” Sanders v. State, 946 So.2d 953, 957 (Fla. 2006) “The jury pardon checks the severity of the consequences required by law.” Id. The rule of lenity and option of the jury exercising its pardon power were of particular significance to Appellant. As a result of his conviction in this case he became a convicted felon and was sentenced to serve eighteen months in the Department of Corrections. Had he been convicted instead of “attempted DUI” he would have faced misdemeanor consequences. Should this Court find that the trial court erred in refusing to instruct the jury on attempted DUI, the decision would have limited impact. Mollenberg would rightfully control the question of whether attempted DUI applied to the issue of impairment. An attempt instruction should only be given in those cases where there is no direct evidence of driving. Appellant was asleep in a car in a parking lot. The jury should have been allowed to consider the lesser-included offense of attempt. 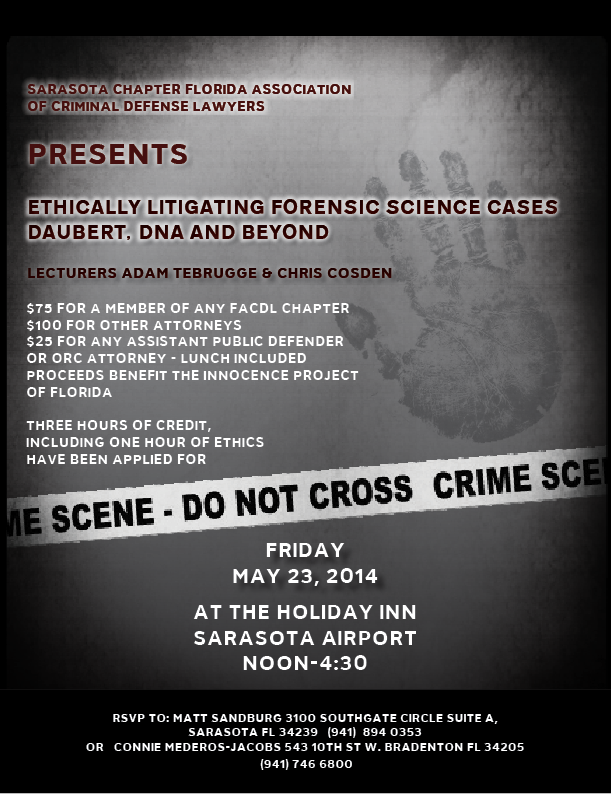 Powerpoint presentation for my lecture on "Ethically Defending Forensic Science Cases: Daubert, DNA and Beyond" delivered May 23rd, 2014 to the Sarasota Chapter of the Florida Association of Criminal Defense Lawyers. My powerpoint presentation delivered at "Death is Different" in Orlando, Florida on March 7th, 2014, can be found here. A Texas law allows defendants to fight bad forensic science. Scientific evidence can be the most convincing element of a criminal trial. But sometimes it's wrong—and for the first time, a state's justice system has recognized that and adjusted accordingly. insights into the development of flawed forensic science claims during post-conviction relief focused on ineffective assistance of counsel. I was fortunate to attend the “Daubert Litigation Training for Florida Criminal Defense Attorneys” held January 31, 2014 in Orlando. The seminar was sponsored by the Innocence Project of Florida, the Florida Association of Criminal Defense Lawyers, and the Florida Public Defender Association. Seth Miller put together this seminar in a creative manner. First speaker Joe Sanders is a Plaintiff’s consumer attorney who has litigated Daubert issues in a variety of contexts. His presentation contained a wealth of useful material. Keith Findley, Director of the Wisconsin Innocence Project, gave a comprehensive history of the rise and fall of the “Shaken Baby Syndrome.” Carrie Sperling from Wisconsin had many helpful pointers about what should be included in a Daubert motion and hearing. And Ernie Chang knocked ballistics and firearms evidence out of the park. The litigation that he described sets the new standard for effective assistance of counsel in any case where firearm or tool mark identification is at issue. When we think about the three sponsoring organizations we tend to focus on the day to day defense of individual clients. This conference showed how influential our work is to overall criminal justice reform. So called experts have been testifying to made up “facts” and unproven theories for too long. I really appreciate that we now have an opportunity to meaningfully challenge false forensic science evidence.